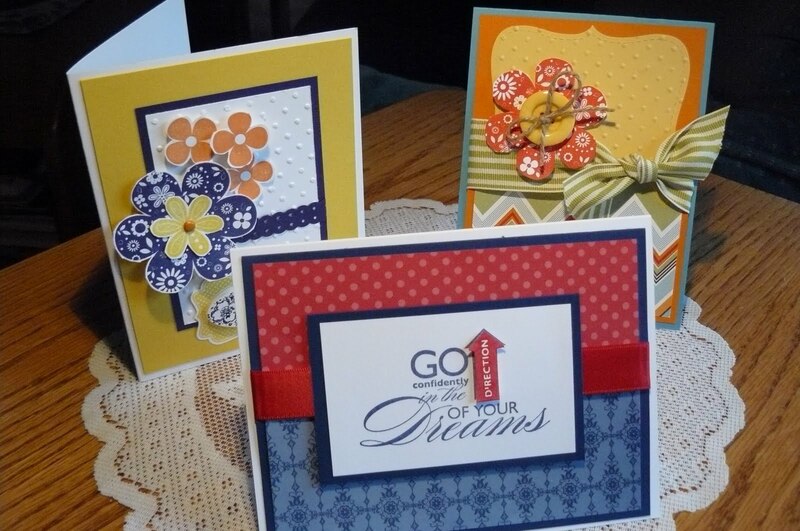 May All-Occasion Card Class featuring Scrapbooking Promotion stamps! I want to share a quick photo of the cards (3 of the 4!) we'll be making in tonight's class at my home using 2 of the stamp sets that are discounted as part of Stampin' Up! 's scrapbooking promotion until May 31st (*seen here): Word Play and Printed Petals. We're also making one more card using the Baby Wipe Technique -- it's a very cool tie-dye technique that is going to bring you back to the 60's!! I'll share that card with you all tomorrow! 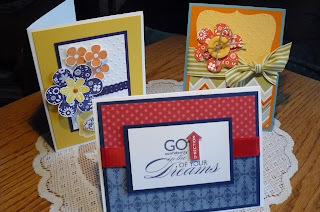 I've definitely case'd these cards from cards made by other demonstrators on Stampin' Connection, the part of Stampin' Up's website specifically for SU demonstrators to share their creations and ideas with other demonstrators. The card in the forefront would work well for a graduation card or to celebrate a success of your favorite person (maybe a new job? a new home?). The back two cards use Printed Petals and I absolutely love how they turned out! The one on the right doesn't have any sentiment so it's perfect for any occasion! So ... hope you can make it! Place: My home -- contact me for directions! Enjoy your day, and happy stamping!